I love ribs. In fact, most people do. Restaurant-style seems to be the most popular, and it’s quite easy to make them at home if you follow a few easy steps. Although ribs come out very tender when made in the slow cooker, they also end up with a lot of liquid; that is not how they’re served in restaurants - the liquid tends to make them soggy and they fall off the bones. Ribs are best slow-cooked in a smoker or barbecue grill outdoors. (they can also be done well in the oven.) I always do several racks of ribs at Halloween since they are one of the most important components of the dead body that I feature at my annual Halloween BOO-ffet (the body has a scary meatloaf head, hands with crispy cheese that make them look like they have been burned in a fire, severed werewolf feet loaves, intestines made from sausages connected with casings, chicken wing thigh bones, and loaves of bread made to look like femur bones – I’ll be posting each component before Halloween this year – all dressed in clothes), and the ribs are the most popular with my guests due to a sweet and spicy dry rub that I developed several years ago. The following rub is perfect for ribs, steak, brisket, chicken, pot roast, rib roast, chicken wings, turkey breast, and anything else you happen to slow cook or smoke on the grill or in the smoker. It’s easy to make, and keeps on the cupboard shelf for months. These Sweet and Spicy Smoked Ribs will be a favorite for everyone who likes a little heat along with moist delicious ribs. You can use any kind that are on sale, but the most tender are baby backs. Heat a smoker or grill to 250°. Place your favorite wood chips prepared (some require soaking in water) according to manufacturer’s instructions for your smoker or grill. Fill the water cavity with water or place a small pan of water on the grill (2-3 cups). 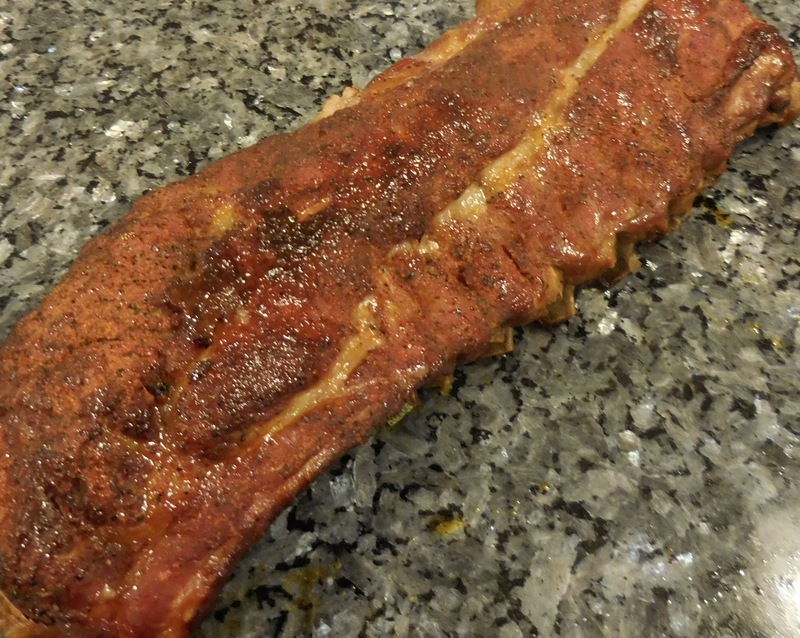 Rub all sides of the racks of ribs with as much of the rub as you can get to stick. Place on a pan if using a smoker, or directly on the grill (on the side without the heat) if using a grill. Let the ribs smoke 3-4 hours, depending on the size, checking occasionally to make sure they don't burn or overcook. 1 1/4 cups white sugar, 1 1/4 cups brown sugar, 1/2 cup salt, 1/4 cup black pepper, 1/4 cup paprika, 3 tablespoons cayenne pepper, 2 tablespoons garlic powder, and 2 tablespoons onion powder. Store in an airtight container at room temperature.